Mitsubishi download a car competition - a torrent / P2P scavenger hunt! 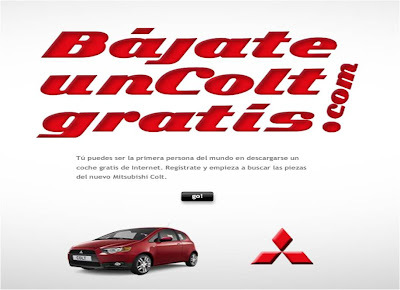 Mitsubishi are offering (Spanish) internet users the chance to win a new Mitsubishi Colt. 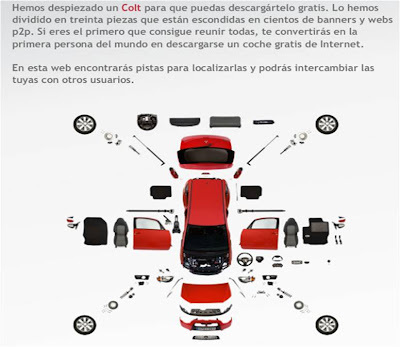 Timed to coincide with the start of the Barcelona Motor Show today, the first person who can find the 30 Colt parts hidden on the internet will win a new Mitsubishi Colt! Mitsubishi are describing the Colt 'as the first car you can download for free from the internet.' The 30 car parts are hidden across various P2P and torrent download sites, with competition participants having to download all the pieces to win. Unsurprisingly, this competition has attracted significant interest from download sites and forums! Mitsubishi Colt download competition - the parts to find! Cheers for the hat tip Nick - I'm loving the idea of this (and even though I don't live in Spain) I wish I spoke Spanish to participate.